It looks like Living The Country Life is getting a big boost now that Meredith has teamed up with Learfield Communications. I recorded a conversation with Learfield’s Stan Koenigsfeld, who describes the whole project and what they are planning for those people who have an above average annual household income and live on 3 or more acres. 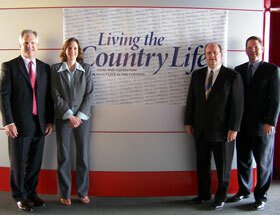 Pictured here are Stan Koenigsfeld, President of Learfield’s News Division, Betsy Freese, Editor-in-Chief of Living the Country Life LLC, Tom Davis, Group Publisher and Doug Olson, VP Publishing, Successful Farming/WOOD/Living the Country Life and Operations. Capturing and serving the growing affluent rural lifestyle market is the goal of a newly created joint venture announced by Meredith Corporation and Learfield Communications, Inc. Learfield is purchasing an ownership stake in the Living the Country Life brand which will be managed jointly by the two companies under the name Living the Country Life LLC. Meredith will maintain controlling interest in the new company. The Living the Country Life brand (www.livingthecountrylife.com) includes a magazine with a distribution of more than 200,000 highly targeted households; a weekly television show on RFD-TV; a web site; and the most comprehensive database of “ruralpolitans” available in the marketplace today. The new business will combine Living the Country Life’s current products with a nationally syndicated radio program and a greatly enhanced web presence. Also, the magazine will increase its frequency of publication.